How to Juice a fresh Pomegranate. There are several ways to do this, depending on the types of kitchen tools you have at home. The easiest way is to cut a pomegranate in half, and juice it with either a reamer (like you would for fresh orange juice) or a manual juicer. 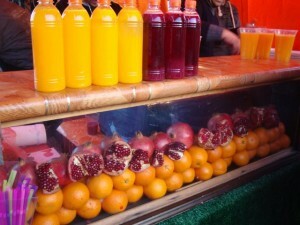 This is what they do on the streets of Turkey, as well as in Berlin, where fresh squeezed pomegranate juice is readily available — and cheap! 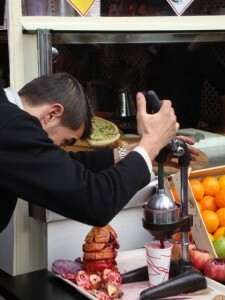 A vendor making fresh Pomegranate Juice in Istanbul. Here he uses a hand crank juicer. 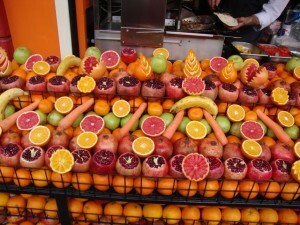 Beautiful pomegranates on display in Istanbul.